The Pharisees were “hypocrites” filled with “malice.” They were also cowards in that they would not even act on their own malicious plot. Instead, they sent some of their own disciples to try to trap Jesus. From the point of view of worldly wisdom, they set a very good trap. Most likely, the Pharisees sat and discussed this plot in great detail, instructing these messengers on exactly what to say. They began by complimenting Jesus telling Him they know He is a “truthful man.” They then go on to say that they know Jesus is “not concerned with anyone’s opinion.” These two accurate qualities of Jesus are spoken because the Pharisees believe they can use them as the foundation of their trap. 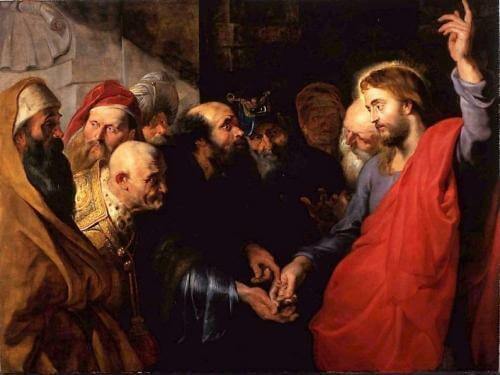 If Jesus is truthful and not concerned about other’s opinions then surely they expect Him to declare that there is no need to pay the temple tax. The result of such a statement by Jesus would be that He would be arrested by the Romans. The sad truth is that the Pharisees spend a tremendous amount of energy plotting and planning this malicious trap. What a waste of time! And the glorious truth is that Jesus spends hardly any energy dismantling their plot and revealing them for the malicious hypocrites they are. He states, “repay to Caesar what belongs to Caesar and to God what belongs to God” (Matthew 22:21). In our own lives, there are times when we may find ourselves face to face with the malicious intent and plotting of another. Though this may be rare for some, it does happen. Often times, the effect of such a plot is that we become deeply disturbed and lose our peace. But Jesus endured such malice so as to show us the way to handle the attacks and traps we may encounter in life. The answer is to stay grounded in the Truth and to respond with the wisdom of God. God’s wisdom penetrates and foils every human act of malice and trickery. God’s wisdom is able to overcome everything. Reflect, today, upon how deeply you trust the wisdom of God to guide you through life. You cannot make it on your own. There are traps and snares that will inevitably come your way. Trust in His wisdom and abandon yourself to His perfect will and you will find that He will guide you every step of the way. Lord, I entrust my life to Your perfect wisdom and care. Protect me from all trickery and guard me from the plots of the evil one. Jesus, I trust in You.